When wiseguys are in prison, does rank matter? Carmine Agnello held his own against three. Opinions vary. On the inside all made guys are equal, some say, while others have said rank is less of an issue. Still, supposedly there are official Cosa Nostra bosses serving life sentences: Vic Amuso, Peter Gotti and Carmine Persico. So rank must matter, but it seems to depend on the place, the time and possibly the dynamic of those inside the unit. I recently heard about something that happened involving Lee D'Avanzo when he was a resident of MDC Brooklyn. The source was there at the time, but on a different floor. Agnello and D'Avanzo were housed in Brooklyn's MDC along with Francis "BF" Guerra -- the only three Italians on the main population floor at the time. In terms of corroboration, I found a news story from October of 2000 regarding Agnello being placed in "the hole" -- meaning, in isolation -- for brawling with some inmates "who attacked him because they didn't like his attitude," as Murray Weiss wrote in the New York Post. The story accurately reports the events, but the speculation as to why Agnello fought -- quite capably, too, as you'll notice -- is entirely wrong. He fought over phone privileges, not attitude, the source told me. Sources say three inmates inside the Metropolitan Detention Center in Sunset Park attacked Carmine Agnello, a reputed captain in his father-in-law’s Gambino crime family, last week. Sources say the inmates did not like Agnello’s attitude. “[Agnello] was signaling to everyone to leave him alone because of who he was,” one source said, referring to his connection to the Dapper Don. “He was flexing his muscle, and they did not take kindly to him, his attitude, and wanted to take him down a peg,” the source continued. The brawl involving the burly Agnello occurred in a large common area shared by 200 inmates in the MDC, where the inmates sleep in bunk beds next to one another, the sources say. Guards had to rush through a crowd to get to the combatants and halt the fight, sources say. After the dust-up, Agnello and the other unidentified combatants were placed in the facility’s Special Housing Unit and restricted to their individual cells for 23 hours a day. “He’s in the hole,” a source close to Agnello confirmed. Agnello – estranged husband of Gotti’s glamorous author daughter Victoria – was in Brooklyn Federal Court last Friday, but displayed no visible signs he had been in a fight. Agnello, the multimillionaire owner of a scrap-metal company, I was told, was unfairly stigmatized by a comment John Gotti made. Now it's a great comment, hilarious, but it probably says more about the state of mind of the man who said it versus the man mentioned in it. 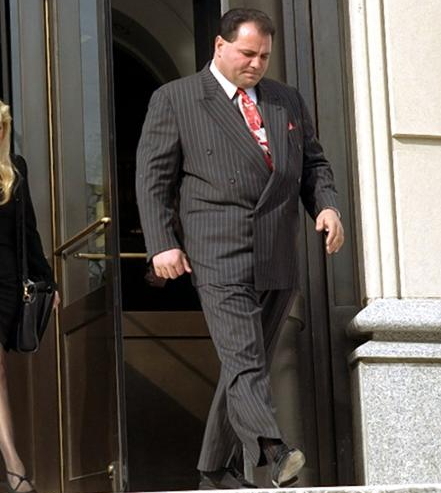 Agnello was facing a 35-count indictment for extortion, arson and tax fraud. His wife had filed for divorce. My source tells me Agnello wasn't fighting three Puerto Ricans over his attitude. He did it to get Lee D'Avanzo phone privileges. The Puerto Ricans ran the telephones in the unit. For some reason (I assume having to do with remuneration or the fact he was a Gotti in-law, though Victoria was filing for divorce at the time, something I doubt guys in the MDC would know about). Bottom line: Carmine was able to use the phone. Lee and Guerra were S--t out of luck. No phonecalls for them, not while the blacks and Puerto Ricans ran them. If you watch those NatGeo documentaries about prison, you'll notice many fights -- including stabbings and murders -- are caused, ostensibly, over use of a telephone. Carmine wasn't having any luck. And things eventually got heated. At some point, he was jumped by three guys. Agnello, on his own, fought it out. Why did he fight it out on his own? Where was the guy he was trying to help in the first place? Agnello, a made guy, wasn't happy with Lee after that. There supposedly were even some sit downs later on over the matter. Ever considered automating your free BTC collections by using a BITCOIN FAUCET ROTATOR? If you're looking for the most recommended bitcoin exchanger, then you should know YoBit.